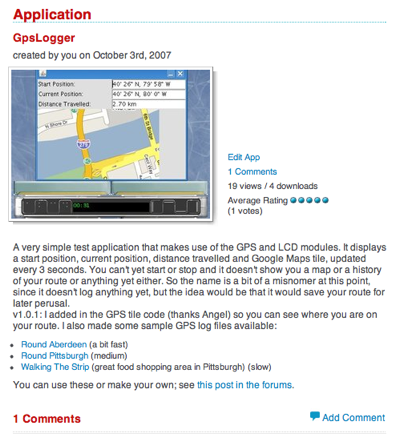 I added the Google Tile code from one of the sample apps to my el-cheeso GpsLogger application for BugLabs last night. So now it shows the appropriate Google tile for where the position module is reporting that you are right now. I also created a few NMEA data log files using Google Earth and gpsbabel, so that I could have different fake routes to watch it run (since there's obviously no actual GPS chip in the Virtual BUG it just reads position data from a file).